In 1813, Mr. Loughborough sold both buildings and they were not to be united under one owner until 1926, when Edlows Department Store purchased both properties. In 1957, the Honorable and Mrs. Gordon Gray purchased the property, and in 1960 gave it to the Junior League of Washington. The League extensively remodeled the interiors and restored the facade to its original Federal design, following a photograph from the 1880s. 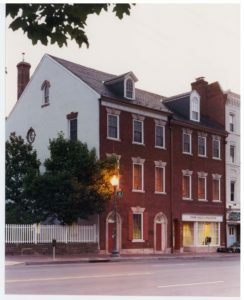 In 1998, JLW conducted another renovation to create a better space for its trainings and meetings. Updates included an overhaul of its electrical and HVAC systems, as well as structural strengthening. The interior was also remodeled in federal style to match the facade. Junior League of Washington welcomes its members and invited guests to use and enjoy the Headquarters for League business and League-sponsored events.